Buy your dream car using the carefully collated information here - Get complete information on Tata Storme - prices, engine performance and other features in this exhaustive automobile and bike section. Madrasi.info is your Chennai city guide. From automobiles to education, from latest cars to travel destinations, you will find it all here. The true blooded Indian SUV - Tata Safari has a new Avatar - Storme. It is well equipped and true to its lineage - immensely comfortable for a long journey. The new Safari, christened as Tata Storme still uses the proven 2.2 DICOR engine with a different tune - now called as VariCor. May be they also made some changes to the engine. This time it has hydraulic lash adjusters to quieten the diesel clatter at low engine speed. As it is Safari's DICOR engine has notched a reputation for being quick and quiet. Safari is still unmatched for its comfort and vast space - you can practically move your house in this Big Tata. Remember Tata started into automobiles by manufacturing trucks. Storme has all the creature comfort of the Safari - with some additions in the safety region. Now all the versions come with ABS and EBD. With the kind of steel Tata uses for its flagship Safari, I would rather be sitting inside a Safari than in any other car in India. Storme has ventilated Disc brakes in the front wheels and disc brakes in the rear wheels, which translates to better brake efficiencies. From the initial reports, it appears that Storme is really a 'true explorer' with matching power and incredible comfort. But on the flip side, they moved the spare wheel to the bottom which makes Storme look boxy from the rear. But the trapezoid twin exhausts and the projection head lamps make the SUV stand out from the rest. Tata Storme Specifications: Tata Storme has 2.2 L Varicor engine which delivers 140 BHP with a torque figure of 320 Nm. This model comes with Air conditioning as standard fitting. Storme from Tata has Power steering and Power Windows. It is outfitted with central door locking in tune with its class. Tata Storme - SUV Car segment is equipped with a 5 speed gearbox. 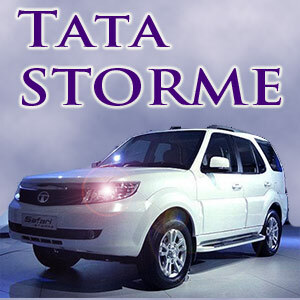 Tata Storme Price: Tata Storme in India costs approximately about Rs. 9.6 lakhs (showroom price)for the base version in Chennai( Price may vary depending upon the local taxes and Octroi ) at the time of publishing this page. Please note that the car manufacturer - Tata may increase/decrease the list price at any time. Again you may note that the price mentioned here is for the Diesel variant. On the road price will depend on the GST, Road tax, Insurance and extended warranty fees if any. Storme Fuel Economy: This car runs 10 km per liter of Diesel in city driving conditions while it runs 15 km per liter of Diesel in highway conditions. In other words, the fuel economy of Storme is Rs. 7.1 per kilometer. If you drive about 1000 km in a month, you will be spending about Rs. 7100 on your fuel ( at the prevailing fuel price in Chennai). Your actual mileage may vary. The information presented in this page has been collected from the respective web site of the manufacturer amongst other reliable sources. We have summarized the various features of this Tata Storme in a tabular format below.